Six Seacoast Fitness Studios and Why We Love Them! Group fitness that puts an emphasis on FUN?? Count us in! With a robust list of classes to select from 7 days a week, Liz and her crew make exercise fun and approachable for each person who walks through their doors. Whether you’ve never been to a gym before, or are an ultra-marathoner, LizFit is a good “fit” for everyone! Strength? Length? Cardio? Check, check, and check! It’s all offered through a variety of classes here at Pure Barre’s spacious studio at the trendy Portsmouth Green plaza. Our new favorite class? Pure Reform! This multi-location fitness club offers everything under the sun, from group fitness classes and free-standing machines, to tennis, swimming, and racquetball! Variety is the word at SSC, and we’re into it! Plus… ummm… they have saunas! A cozy studio in the heart of downtown Portsmouth, Barre & Soul offers a variety of yoga and barre classes every day of the week. With an emphasis on mindfulness and community, this studio is one of a kind! Fun Fact: Barre & Soul was founded by an Ogunquit native! Saddle up. Dim the lights. Tune out the world. Turn up the beat. 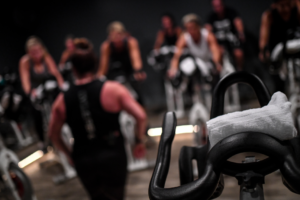 More than a boutique indoor cycling studio, CycleFierce brings mindfulness, motivation, and community to every ride offered at its hip Portsmouth Green studio. Monday Night Magic anyone?? If you’ve never been, let’s change that, because owner Jen always provides a ride to remember! While we haven’t yet experienced the wonders EVOLVE offers first hand, we can’t wait to step on our mats at this upscale and welcoming downtown Portsmouth newcomer! First on our list to try? Warm Vinyasa Yoga and Mat Pilates! Also, hello teen membership!